Solution, to see the on screen keypad at log in in Windows 8, 8.1 and Windows 10! ► Please see the screenshots (1 & 2) for login without the keyboard, via virtual keyboard! ... How to find Windows 8 On-Screen Keyboard? To enable or disable the password prompt for screen saver in Windows-8 / 10 or 8.1: Content: 1. Enable or disable the screen saver password 2. How to show Control Panel, My Computer, Network on Windows 8, 8.1 Desktop and Win 10? Which version of Windows 8 is right for me? How to close windows on windows 8 without useing key pad? Windows 8 on screen keyboard startup? How to log into windows 8.1 and in new windows 10 without a keyboard? Windows 8 on screen keyboard start on boot? At the time of log on virtual key board not displayed? Logging into windows 10 and 8.1 without a keyboard? Numeric keypad at startup with windows 8 and 8.1? HOW TO DISPLAY THE NUMBERS PAD ON SIGN IN WITH WINDOWS 8.1 and 10 ? Numeric keypad in windows 8.1? Change power settings for the screen log-in page in windows 8.1 and 10 ? How to turn on windows 8 on screen keyboard on startup? How to include on-screen keyboard in windows 8 startup? Can I add a calculator to my onscreen keyboard Windows 8.1? Windows 8 and 10 numpad? How to open elevated keyboard on windows 8.1 log in screen? Windows 8.1 on screen keyboard password? Numberic pad on keyboard active at login? Windows 8.1 force onscreen keyoard on log in screen? Windows 8 on screen keyboard login screen? Windows 8 login screen on screen keyboard? Windows 8 starts without keyboard? Windows 8 start screen without windows key? On screen keyboard not working on windows 8 startup? Keypad sign in windows 8.1? 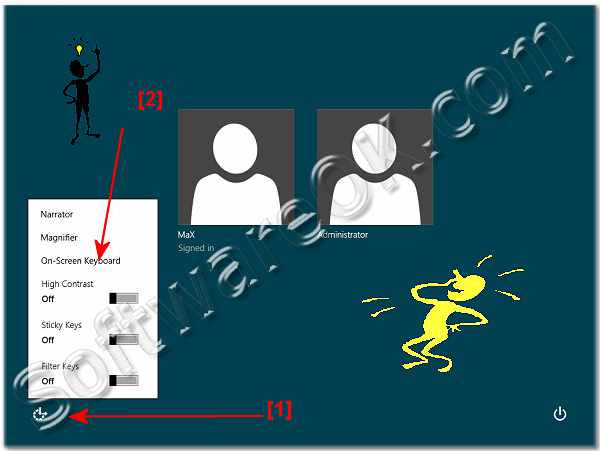 How to set up on screen keyboard for log in windows 8.1? On screen keyboard at logon in windows 8, 10 and 8.1 log in without keyboard? Windows 8.1 startup keyboard number pad disabled? I need on screen keyboard at power up login for windows 8.1? Number keypad not working windows 8? Windows 8.1 software keyboard opens on boot? How to make windows 8 login use keypad instead of keyboard? Why windows 8 change the numeric keypad? How to change number keypad on windows slate? Disable startup on screen keyboard windows 8? How to log in to windows 8 without a keyboard? On screen keyboard windows 8 and 10 start on password screen? On screen keyboard in windows 8 start? Windows 8.1 can i bring up a separate numeric keypad on my screen? Windows phone 8.1 numeric number pad control? Windows 8 how to disable switch off numeric keypad? How to turn number pad on at startup windows 8? Windows 8 on screen keyboard in start menu? Missing keyboard on windows 8 login? Windows 8 startup screen shots? Number pad and number key setting in windows 8 and 10 ? How to use on screen keyboard in start menu windows 8 and 8.1? Start page of windows 8? Windows 8 login screen keyboard? On screen keyboard at log in windows 8? On screen numpad windows 8? What is a one - screen keyboard on Windows- 8 and 8.1? Turn number key on at start screen? On screen keyboard on windows 8 start page? How to use keypad for pin on startup with windows 8.1 and in new windows 10 ? On screen function key pad for windows 8? Windows 8.1 without keyboard at login? Windows 8 on screen keypad at startup? Login screen saver with virtual number pad? Windows 8 on screen keypad to log in? Windows 8 virtual keyboard square space? How to start up with keypad on login in Windows 8.1 and in new windows 10 ? How to activate log in keyboard when turning on pc on os 8.1? How to you bring up the key pad in windows 8 start menu? I have not money for a keyboard, how to find the on screen keyboard for my windows-8, or must i buy one for this new ms operating system? Windows 8 remove virtual keyboard from login screen? Control whether the On Screen Keyboard starts when I log on? Windows 8 keypad numbers, windows 8 and 10 startup settings keyboard not responding? 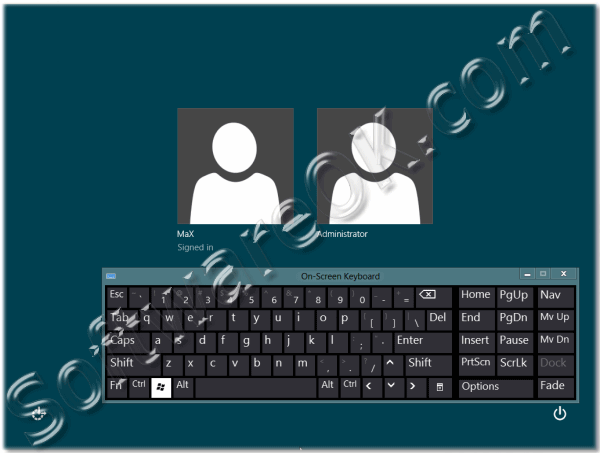 How to access onscreen keyboard in windows 8 start? On-screen keyboard windows 8.1 displayed at startup? Windows 8 virtual keyboard on login? Win 8 numeric keypad access? Change ten Keypad layout Win 8 Samsung? How to disable number key pad on laptop running windows 8.1? How to set up numeric log in for windows 8? How to use on screen keyboard in login screen windows 8, 8.1 and windows 10? How to bring up windows 8 menu when logging in? Access keyboard in windows 8 and 10 start menu? Windows 8.1 at startup keypad download? Windows 8 on screen keyboard in start screen?